Hey friends! 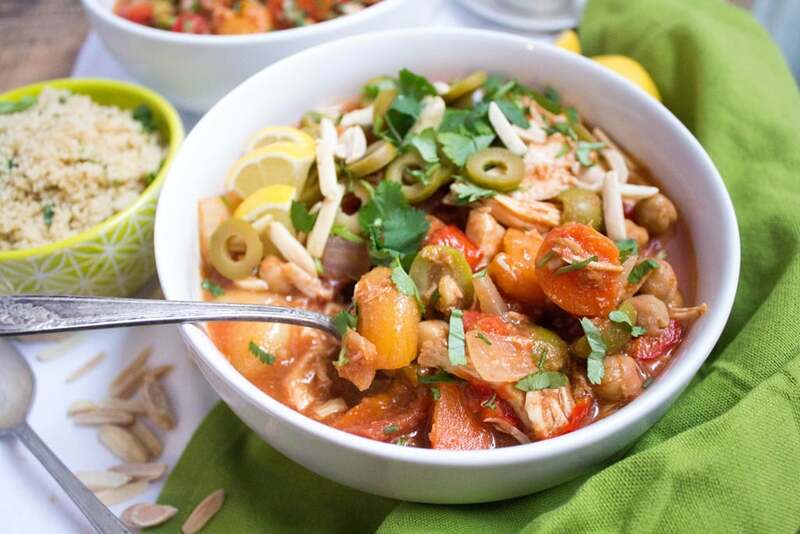 Get pumped – it’s slow cooker time. I’ve had requests for more slow cooker recipes here on the blog and I’m excited to share this new favorite recipe for slow cooker Moroccan chicken stew with you today! 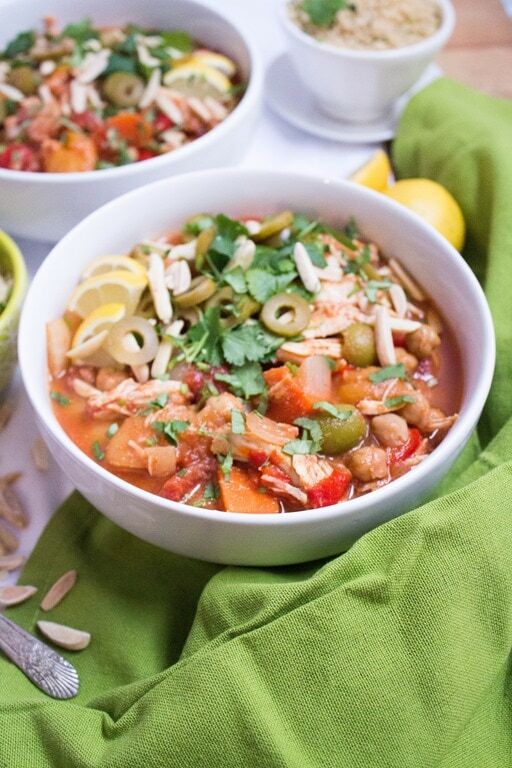 I love slow cooker recipes because the work is all done up front, and once you’ve tossed all your ingredients into the slow cooker all you have to do is wait. Go to work, take a yoga class, run errands, or simply hang out – and a few hours later your meal is ready and waiting. This dish requires some veggie chopping up front but it’s worth it, trust me. The olives, apricots, and spices are what gives it a fun Moroccan-ish flair! 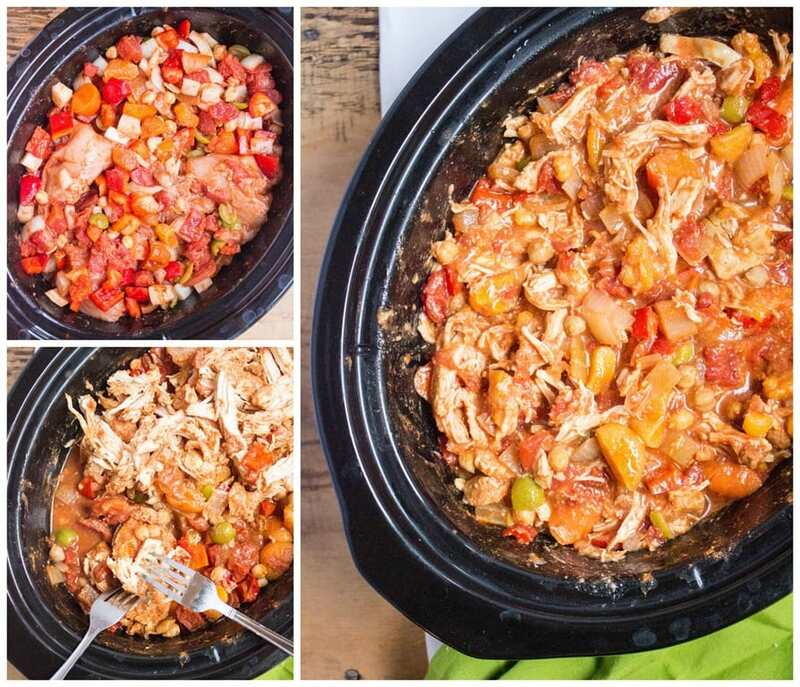 Once everything is chopped and prepped, all you do is toss all the ingredients into the slow cooker (FYI this is the slow cooker I have and love), stir it up, set the timer, and get ready to eat! The final step is to shred the chicken just before eating. That’s it! 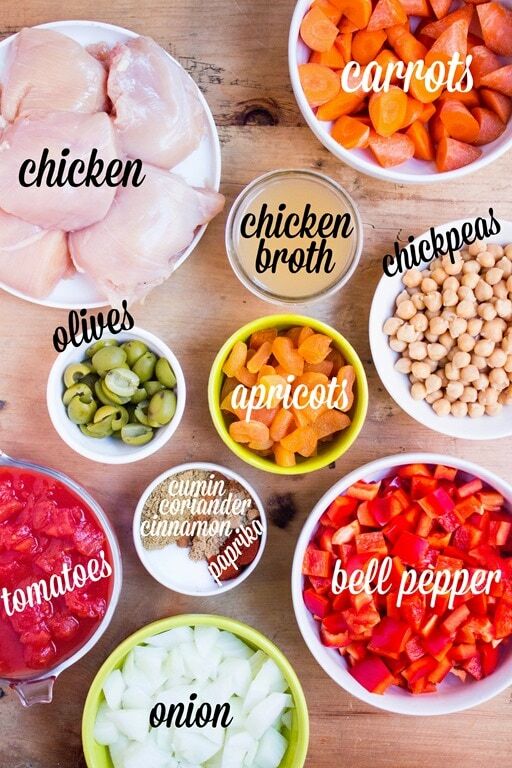 Place all ingredients in a slow cooker and stir. Cook on high for 3-4 hours or low for 6-7 hours. When done, shred chicken pieces with two forks and stir to mix back into the stew. 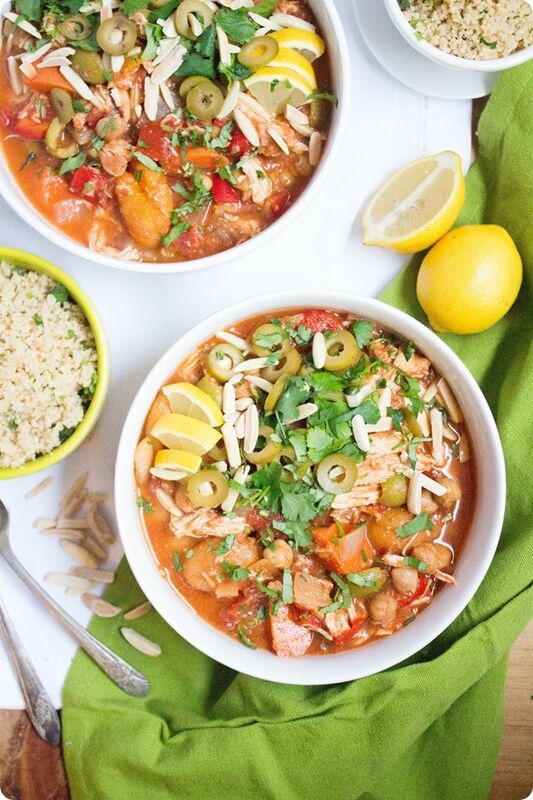 Serve with rice, quinoa, or couscous, and top with cilantro, chopped olives, and toasted almonds. Serve over rice, quinoa, or couscous, with some fresh cilantro and additional chopped olives and toasted almonds if you’re into it. Either way – enjoy! What other types of slow cooker/crockpot recipes would you like to see here on the blog? Happy to share more in the coming months if I have requests! Previous article: The Joyful Eating Self Study Program is here! This looks so good – such a great combination of flavors. Thanks for sharing. Looks good! Hilarious expat story, my American friend here in Paris just got so excited because she got as a Christmas gift a slow cooker with a european plug, somehow! (Apparently they are not easy to find here, and she didn’t want to use an American plug with a converter for fear of fire hazard). She’s been making recipes like crazy, I’ll have to send her this one!!! What an interesting addition, Apricots!!!! I love my slow cooker, but I am contemplating an instant pot!!! This looks very tasty, Anne! Maybe you should market it! I love olives, but I wouldn’t put them on top of this stew. How come? It was delicious with extra olives on top! This looks incredible. 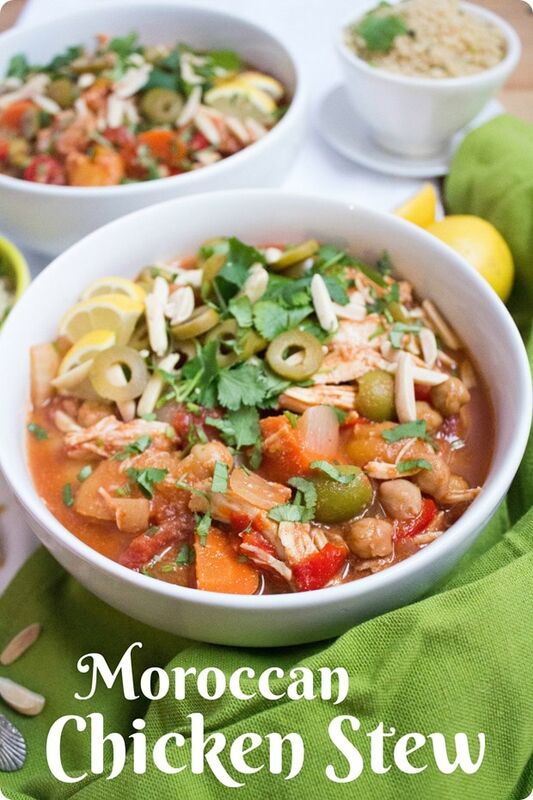 I am always looking for things to make in the crockpot with chicken! This looks delicious! Any idea of the nutritional info? No, sorry! I am very anti-calorie counting so I don’t share nutrition information with my recipes. Hmmm yeah — maybe dice them smaller? Or you can leave them out! Delicious recipe. Only thing I would change would be to add the apricots and olives while the rice is cooking on the stove–the long cook time in the crockpot took the salty brine out of my olives and the sweet chewiness out of the apricots! We even had leftovers today with arugula–just because. Received my Instant Pot today and this was the first dish I made with it. A great first trial, the Instant Pot will definitely stay ;) thank you for sharing this recipe! I used the Slow Cook mode and cooked for 4 hours on high, no problem with the carrots. We had both chicken thighs and chicken breast filet and the first were more tender. I think I used more apricots, it was kinda sugary but we enjoyed it a lot.